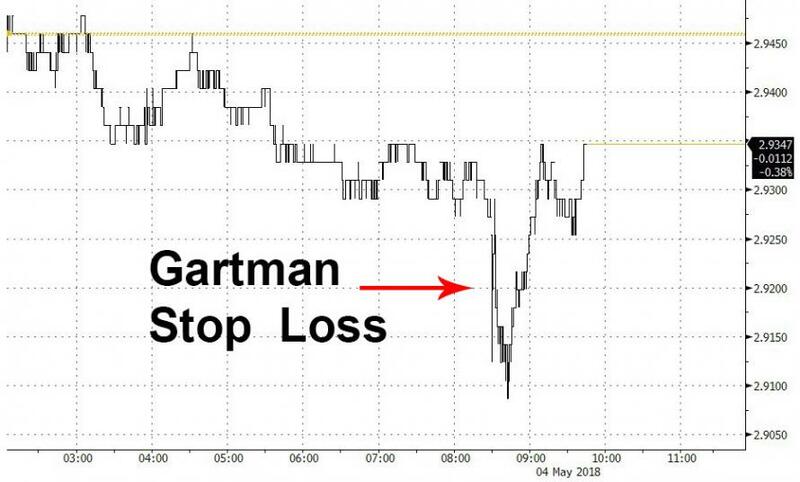 While Gartman may pretend it never happened, it did three weeks ago, when after the April payrolls report, the "world-renowned commodity guru" was stopped out of his short 10Y Treasury position put on just two days earlier, with a 2.92% stop loss level. As we duly documented at the time, the 10Y yield tumbled below 2.91% before rebounding. Gartman clearly pretended not to see it. So fast forwarding to today, in his latest note overnight Gartman writes that "as the news of the cancellation of the US/North Korean summit meeting “hit” the capital markets, the bid for US treasury securities as a safe haven forced us to cut back on our short position a bit as a defensive action." We are not yet of a mind to become bearish of shares for usually it takes this Index rising to 75-80 and then turning lower for us to do so, but we are concerned that the market has gone from over-sold back to neutrality and now seems to be losing momentum to the upside. As he concludes, "Forewarned is indeed forearmed."